We started this podcast because we believe that 100 years after some women won the right to vote in Alberta, there are challenges to figure out, successes to celebrate, inequalities that need to be exposed, and stories to discover. We hope to learn as much as you through our work on this show. 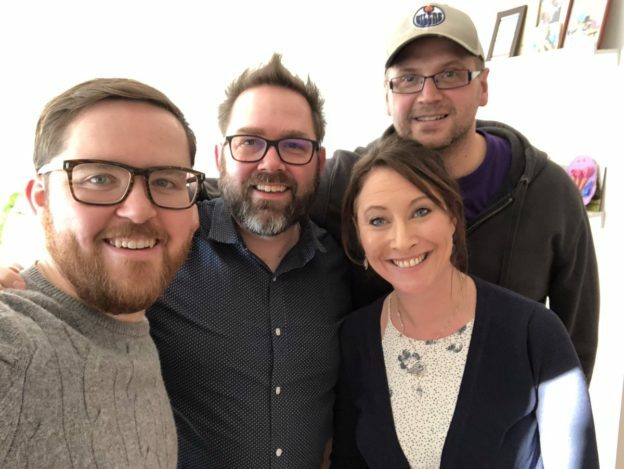 The first three episodes of the podcast include interviews with PC-turned-NDP MLA Sandra Jansen, historian Charlotte Gray, and journalist turned politicians Katherine O’Neill and Danielle Smith. This entry was posted in Alberta Politics and tagged Alex Zabjek, Charlotte Gray, Danielle Smith, Katherine O'Neill, Sandra Jansen, The Broadcast Podcast, Trisha Estabrooks, Women in Alberta Politics on January 27, 2017 by Dave Cournoyer. Alberta’s Minister for the Status of Women Stephanie McLean is heading on a four-city tour to convince more women to run for elected office in next year’s municipal elections. The tour will feature events in Edmonton on October 18, Medicine Hat on October 20, Calgary on October 24, and Lethbridge on October 27. Despite a record number of women being elected to the Alberta Legislature in May 2015, including nearly a majority in the governing New Democratic Party caucus, and the majority of provincial cabinet ministers being women, the number of women elected to municipal office remains low. According to the Alberta government website that promotes the tour and includes an online campaign toolkit, women hold an average of 26% of elected seats in municipal politics and Albertans elected 490 women out of a possible 1,874 municipal positions during the 2013 municipal elections. At the Edmonton event on October 18, the only woman elected to our City Council, Bev Esslinger, will join Ms. McLean and Métis Nation of Alberta President Audrey Poitras for a discussion about how women can launch campaigns for municipal office. The discussion will be moderated by Edmonton Journal reporter Elise Stolte. The Lethbridge event will feature Maryanne Sandberg, Councillor from the Municipal District of Willowcreek. The Medicine Hat discussion will include past mayoral candidate Milvia Bauman, Newell County Reeve and past provincial election candidate Molly Douglass and moderator Christy Pick from Shaw TV Channel 10. The Calgary event discussion will include Piikani Nation Councillor Angela Grier former Calgary City councillor Gael MacLeod and will be moderated by radio host and former Wildrose and PC MLA Danielle Smith. 2016 marks 100 years of women’s suffrage in Alberta. As we can see in the current American presidential race, women candidates face many challenges when it comes to seeking office, least of all still having to campaign hard against an opponent who is grossly under qualified. I have heard it said that women have to be asked five times to run for office before accepting, while it usually only takes men one ask. It is my hope that more women will seek election, and will be elected throughout the province. After all, it is 2016. On the topic of women running in municipal elections, Miranda Jimmy launched her campaign for Edmonton City Council in the southwest Ward 5. She will be facing incumbent Michael Oshry, should he choose to run again. This entry was posted in Alberta Politics and tagged Angela Grier, Audrey Poitras, Bev Esslinger, Christy Pick, Danielle Smith, Elise Stolte, Gael MacLeod, Maryanne Sandberg, Michael Oshry, Milvia Bauman, Miranda Jimmy, Molly Douglass, Stephanie McLean, Women in Alberta Politics, Women in Politics on October 18, 2016 by Dave Cournoyer. In recognition of International Women’s Day, today’s candidate update focuses specifically on the total number of women nominated to run for Alberta’s political parties in the upcoming provincial election. Women make up the majority of our population, but they rarely come even close to being the majority in electoral politics. Women in Alberta politics have accomplished a number of milestones in recent years, including the election of Alison Redford as our first female premier, but the total percentage of women elected to the Legislative Assembly has actually decreased since the late-1990s. 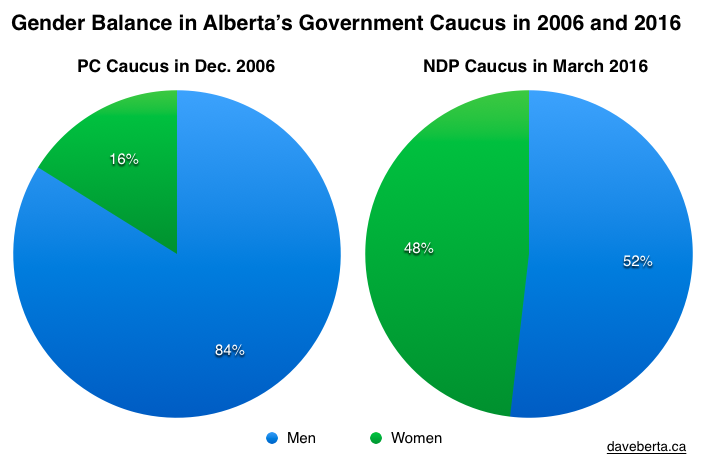 Alberta’s 2012 election was notable for many reasons, most notably because it marked the first time the two major parties were led by women – Progressive Conservative leader Ms. Redford and Wildrose leader Danielle Smith. Three years later, only one major party will be led into the 2015 spring election by a women – the New Democratic Party’s Rachel Notley. Wildrose Party interim leader Heather Forsyth, who has served as MLA for Calgary-Fish Creek since 1993, is not seeking re-election. 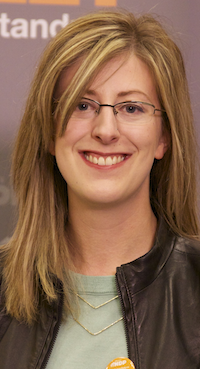 The Green Party, with no MLAs in the Assembly, is led by Janet Keeping, who is nominated to run in Calgary-Foothills. 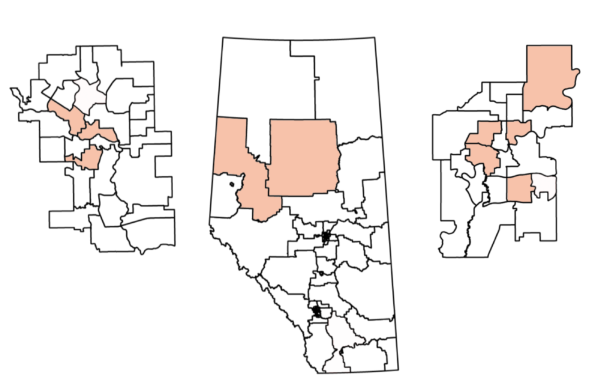 The Liberal and NDP have had women lead them in past elections – Pam Barrett led the NDP during the 1997 election and Nancy MacBeth led the Liberals in 2001 – and former Edmonton school trustee Sue Huff led the Alberta Party until 2011. Edmonton-Gold Bar Liberal MLA Bettie Hewes became the first woman to lead a major political party when she served as interim leader of the Official Opposition in 1994. There are currently 22 women MLAs serving in the Alberta Legislature (25%), down from a high-mark of 23 women MLAs (27%) in 1998. This number decreased upon Ms. Redford’s resignation in 2014, the percentage was still lower than 1998 because the total number of MLAs increased from 83 to 87 in 2012. 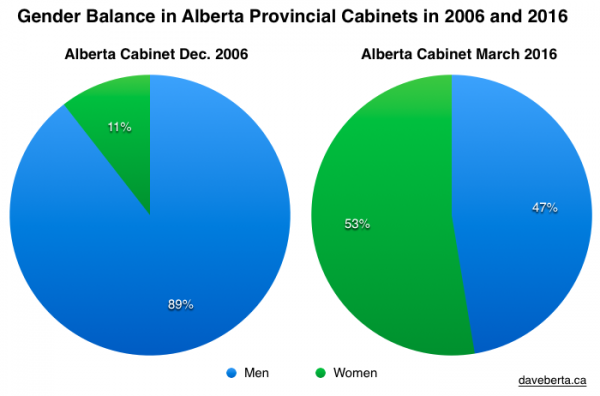 Only four of the twenty members of Jim Prentice‘s current cabinet are women. The longest serving woman in the Assembly is Lesser Slave Lake PC MLA Pearl Calahasen, who was first elected in 1989 and has been acclaimed as her party’s candidate in the next election. First elected in 1997, Edmonton-Centre Liberal MLA Laurie Blakeman is the longest serving opposition MLA. With the next election expected to be called in the next few weeks, Alberta’s political parties are still in the process of nominating candidates. Here is a look at how many women have been nominated so far by the five main parties. The NDP, with a commitment to nominate a high percentage of women candidates, has so far chosen the most women candidates of the political parties contesting the 2015 election. By my count, the NDP has chosen 18 women out of 41 candidates (43%) already nominated or acclaimed. This is slightly less than the full NDP slate from the 2012 election, when that party nominated 40 women out of 87 candidates (45%). The Progressive Conservatives have chosen 13 women out of the 58 candidates nominated to run in the next election (22%) as of today. In the last election, the PCs nominated 22 women in their slate of 87 candidates (25%), which was up slightly from 17 out of 83 candidates in the 2008 election (20%). The Wildrose Party has nominated 33 candidates, 5 who are women (15%). In the last election, led by Ms. Smith, the Wildrose Party nominated 11 women in a slate of 87 candidates (12%). The Liberal Party, with 12 candidates currently nominated, has nominated 2 women (16%). The Liberals saw a decrease of women candidates nominated in the 2012 election, down to 18 of 87 (20%) from 22 of 83 in 2008 (26%). 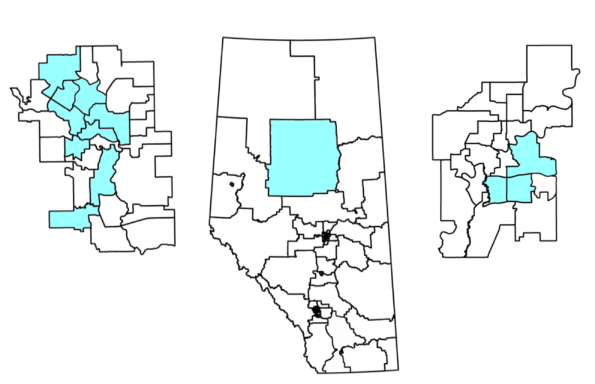 Five of the 17 candidates currently nominated by the Alberta Party are women (29%). This entry was posted in Alberta Politics and tagged Alison Redford, Bettie Hewes, Calgary-Fish Creek, Calgary-Foothills, Danielle Smith, Edmonton-Centre, Edmonton-Gold Bar, Heather Forsyth, Janet Keeping, Jim Prentice, Laurie Blakeman, Lesser Slave Lake, Nancy MacBeth, Pam Barrett, Pearl Calahasen, Rachel Notley, Sue Huff, Women Election Candidates, Women in Alberta Politics on March 8, 2015 by Dave Cournoyer.